Last November a ground-breaking report commissioned by the French President Emmanuel Macron sent shock waves through the art world. It recommended the return or restitution of artefacts from France back to Africa. But what would this mean for museums and cultural institutions? We take the view of leading figures from two cultural institutions in the two continents – Dr Bongani Ndhlovu from the Iziko Museums of South Africa and Professor Nicholas Thomas, Director of the Museum of Archaeology and Anthropology in Cambridge. Before World War II, Simon Goodman’s German-Jewish ancestors owned an incredible collection of fine art, including masterpieces by Degas, Renoir and Botticelli. Under the Nazi regime, that world class collection was confiscated and Simon’s grandparents were murdered in a concentration camp. For The Cultural Frontline, Simon shares his mission to recover his family’s stolen art, after more than half a century. Can technology help bring lost artefacts back to life? A new exhibition called Return to Mosul which opened at the Mosul Museum in northern Iraq this week aims to do just that. We speak to the man behind the project, Mohammed Al-Hashimie about his journey to restore the cultural heritage destroyed by the so-called Islamic State. What does cultural restitution mean to the First Nations people of Canada? The curator Lucy Bell tells the story of why she fought for the return of ancestral remains to her First Nations community, the Haida Nation. 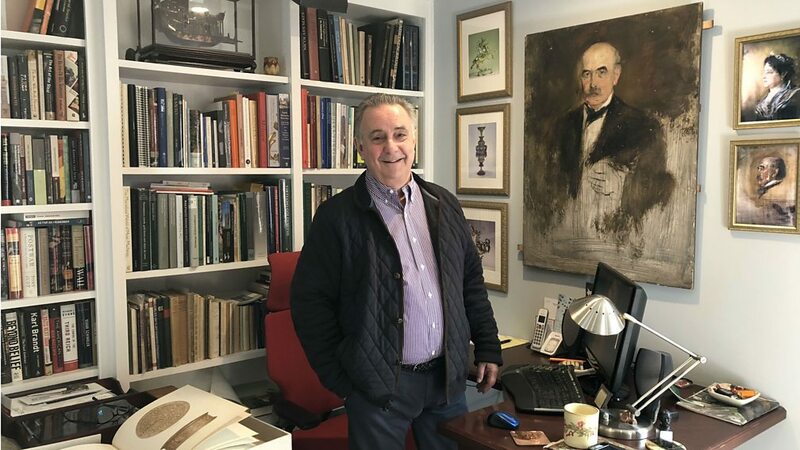 After the death of his father, Simon Goodman embarked on a twenty year mission to reclaim the world class artworks his German-Jewish ancestors had collected before World War Two. Simon's landmark discovery of the Degas painting 'Landscape with Smokestacks', which had once belonged to his family, became the first Nazi art looting case to be settled in the United States. Photo: Simon Goodman standing next to the portrait of his great-grandfather Eugen Gutmann, painted by the German artist Franz von Lenbach (1836-1904). Produced by Mugabi Turya, Kirsty McQuire, Shoku Amirani, Mpho Lakaje, Laura Hubber and Nancy Bennie.